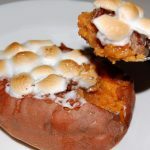 A wonderful take on Twice Baked Potatoes, Great presentation!! Wash the sweet potatoes, scrubbing them well to remove any dirt. 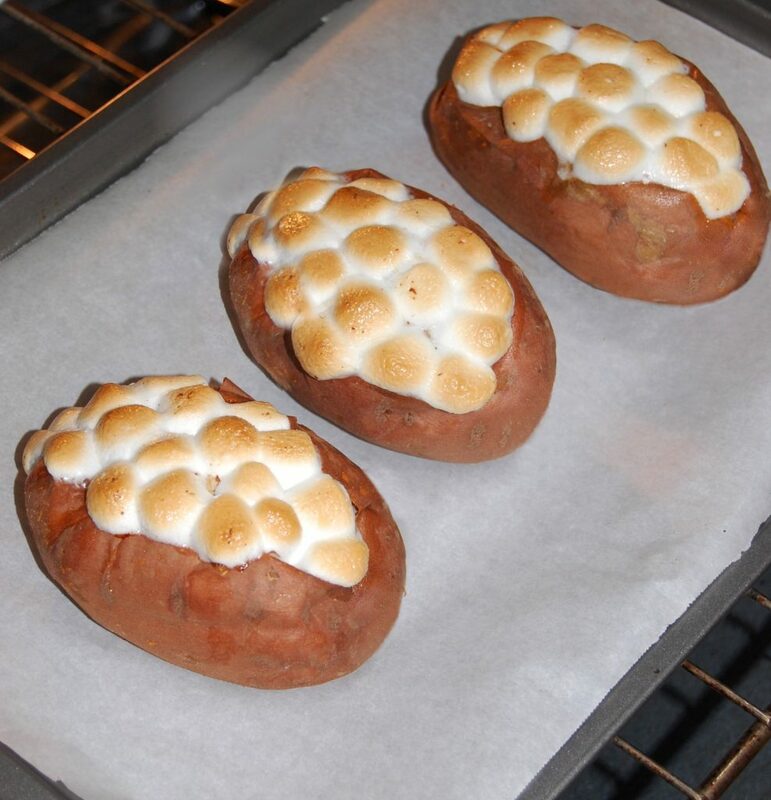 With a fork, pierce the sweet potatoes, place them on a foil or parchment lined baking sheet. Bake for 50-60 minutes, or until a knife inserted in the center goes in easily. Remove from oven and let stand until cool enough to handle, but still very warm. Cut potatoes in half lengthwise and push the ends towards the middle so it opens up. Scoop out flesh and place in medium bowl, being careful not to tear skin. Reserve skins. In a bowl, mix 3 tablespoons butter and brown sugar together until it's crumbly. Add the cinnamon, nutmeg, ginger, salt, and half of the pecans. Add half of the mixture to the sweet potato flesh, mash to combine. Add the filling back to the potato skins and place on baking sheet. To the remaining brown sugar mixture, add 3 tablespoons butter and flour. Mix until crumbly. Top sweet potatoes generously with the brown sugar mixture. Sprinkle with remaining pecans and marshmallows, return to the oven. Bake for another 5-10 minutes, or until the marshmallows turn golden brown.